Update late 2018: After a Halloween rewatch, I stand all the more in awe of Fulci’s truly irrational editing scheme and his almost unholy skill not simply dropping us into an unraveling narrative but demolishing the presumption of rational sense-ordering in horror to begin with. The Beyond remains a truly scrambled, egg-beaten (or brain-beaten) perceptual experience, even in the already demonically playful realm of giallo-inflected fear, let alone the wider horror genre. 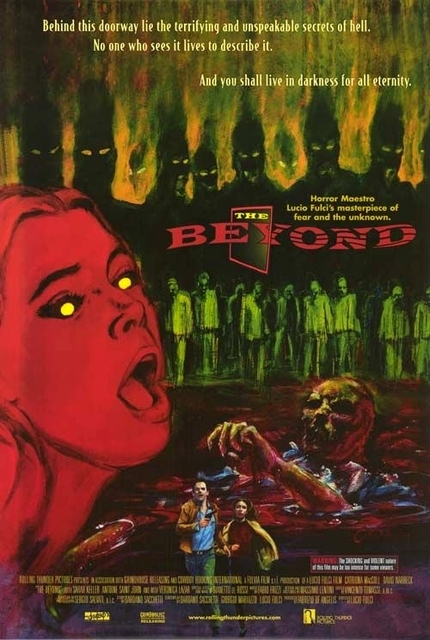 It is a truth undeniable that Lucio Fulci’s 1981 Grand Guignol The Beyond lacks a capable narrative or characters, but this is true only in the way that L’Avventura and Breathless lack much in the way of conventionally sufficient narratives or sensible characters. They are all anti-narrative, anti-character films, and the deficiency is fully intentional in each case. They are films precisely about the deconstruction of narrative, and the characters intentionally maneuver themselves through their worlds in contrived, non-natural ways to illustrate a point about the artifice of narrative, of human activity, and of film and its relationship to the human condition. This entry was posted in Friday Midnight, Review and tagged destroy that continuity editing and grind it to a pulp for me why don't you, exploitation-as-art, haunted beauty, horrific imagery, horror films, italian cinema, Lucio Fulci, midnight screening on February 6, 2015 by jakewalters98.